Choosing a wrap company that you can trust is the key to a lasting and beneficial business relationship. 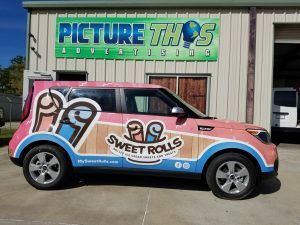 Team Picture This has put together a list of important questions for your vehicle wrap company and took the time to plug in our own answers so that you can make the most informed decision for your company. What types of materials do you use? 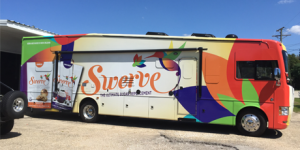 Are you using vinyl specifically for use on vehicle wraps? YES! All of our vinyl is graded for vehicle wraps in order to not damage the underlying paint! Do you laminate your printed wraps and graphics? Yes! Because we take pride in our work, we want it to last! By using a laminate, we are able to have our wraps out in the hot Louisiana sun much longer than if we did not. What certifications and experience do you have? We recently got 3M certified and are one of only 2 shops in Louisiana that holds that certification as well as one of only about 6 on the Gulf Coast with that distinction! Which means that we went through several rounds of rigorous testing on everything from our insurance to design to installation. On top of that, our main installer grew up doing vehicle wraps and graphics and has over 20 years of experience in the field. What is the life expectancy of my wrap? We like to recommend that you only keep your wrap on for about 5 years, however, you can get about 7 years out of your wrap, your removal just may be more expensive due to the challenges with the glue at that time. How will my wrap affect my paint? As long as your paint is in good condition when the wrap is installed(not peeling, no clear coat failure, etc.) Your wrap should actually protect your paint when the correct material is used. That is why it is so important that we use material MADE for vehicle wraps! How can I keep my wrap looking new? You want to make sure to keep your wrap clean. There are washes and polishes specifically made for wraps, however, we like to use dawn dish soap and a non-abrasive brush or washcloth. While it is not recommended because it can cause peeling or scratches, you can take your vehicle through a car wash-just don’t do it often! Will there be bubbles, wrinkles, or other imperfections? Or will my vehicle wrap be “show quality”? When my wrap is removed, will there be cuts on my vehicle? To avoid cutting on your paint, we use knife-less tape, which allows us to cut from underneath the vinyl instead of on your paint! What can I do to best prepare my vehicle for a wrap? We recommend the vehicle is hand washed the day before with no wax or Armor All Spray, as that could negatively affect your install. If it is an issue to get the vehicle hand washed, we are happy to do it for you for an additional charge. Why should I choose Picture This as my wrap company? We hope it is obvious that we are the best company for you! But here are some of the highlights for you! We have been around long enough to have removed some of our own wraps, which is important because our customers can tell you how the wrap held up for them and that the paint was safe! We love our job! We are a team that loves what we do and that passion really helps us give you the best wrap possible! If you have any other questions for us, please give us a call at 504-684-1114 and one of our friendly team members will be more than happy to help! 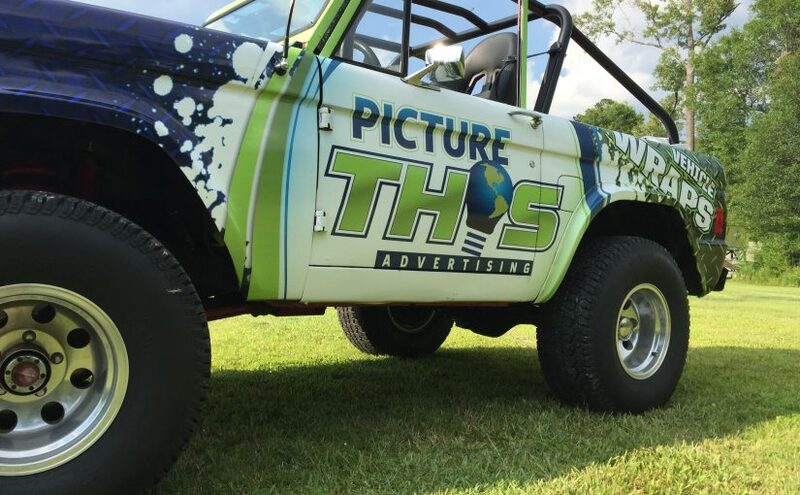 Here at Picture This Advertising, when you come to talk to us about a wrap or anything for your business, one thing you will hear repeated is brand consistency. We want what we do for you to help your business. 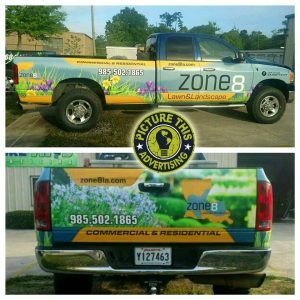 If you have a different look for everything for your business(vehicle wrap, business cards, outdoor signage. etc.) it will not look nearly as professional as if everything has brand consistency. 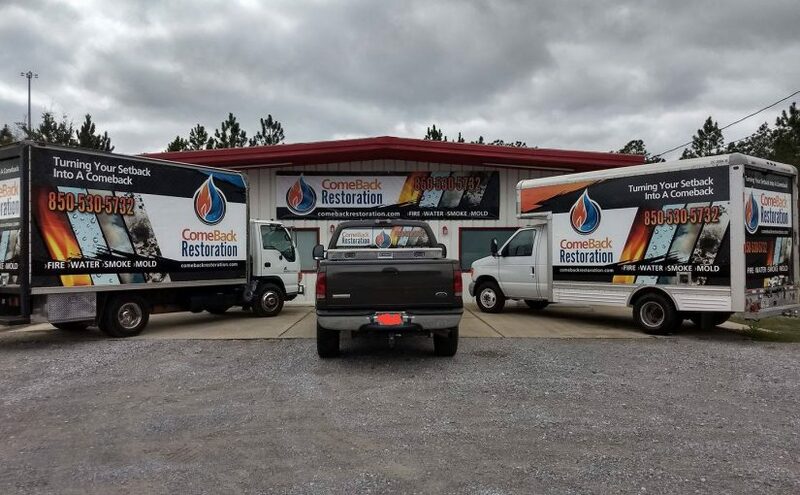 See the above picture of Comeback Restoration’s Fleet for an example. When you check that out you will see that the two box trucks, the back window of the pickup, and the building signage are all consistent and recognizable. This is what we want for your business. Stop by today and let Picture This Advertising help you look as professional as possible! Advertising is something most businesses do to ensure growth and sales but, what is successful advertising? Picture This Advertising has put together some of our top tips for successful advertising. If we were putting together a campaign for a bouquet of flowers, we wouldn’t place that ad on a box of allergy medicine. However, an ad for the new ice cream shop in town would be well placed next to a playground. Make sure you are placing your advertisement in a place that your target audience will frequent. The best thing about vehicle wraps is that the target audience will see if you can guarantee. Possibly people who did not even know they were looking for that product or service will see it and call! If you put out your advertisement and a month later it is tattered and worn, people will think that you do not care about your business. Quality even over quantity in this situation will make a big difference. 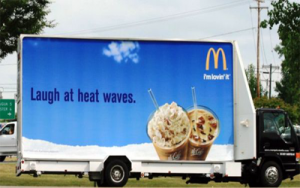 That is why on our vehicle wraps at Picture This Advertising we use 3M materials. As one of only two 3M certified installers in Louisiana, we can offer the high quality of 3M vinyls and the peace of mind with a 3 year warranty on our wraps. When we see a paragraph next to an image, our eyes will always catch the image first. That applies to successful advertising as well. If you can explain your entire business in one picture, do it! Your logo should be memorable and your advertisement should explain your business with as few words as possible! Most people will use a search engine to find your business, so all of your contact info is not necessary, just be memorable. If you own a cleaning service, show someone cleaning. The audience will know what you do and, with a memorable logo, be able to find your business online to give you a call. Our last tip is to track what works. If you can, ask your customer how they heard of you and if they saw your wrap as opposed to your tv commercial, make a note and then use what works. 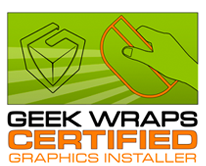 Studies show that for every $1 spent on a wrap, you can generate an average of 2,520 impressions. That is a lot of bang for your buck! We hope this helps you make the best possible decision on how to have a successful advertising campaign for your business!